I’ve been blogging now for a little over four years! It’s crazy to think that it’s been that long. It’s also been crazy to think of how much that God has grown my blog! It seems, He just keeps blessing it and blessing it! The thing is that no matter how much of a blessing something is, there are always risks and rewards to weigh. It seems like every year I have certain times of year when I get super gung ho about revamping my life schedule. One such time is the New Year…I like to make some long term goals, but my actual schedule stays the same because I’m in the middle of the school year. Then everything seems to go out the window over the lazy days of summer. Not totally, but you know—just more down time. The fall! That’s when I really take a look at what my REAL life looks like. Am I over loaded? Do my activities reflect my goals and my heart? What’s happening with my health? Do I have time for the things I really enjoy? The fall is when I ask the hard questions. I take an honest look at the bare bones and make decisions that will affect the rest of the year and further. With my professional blogging I am SUPER busy, I also work part time for our local school district AND have my VA business. Oh and of course there is my family…sometimes they want to see me and have my time. It’s no secret that I am getting older. With that, I’m getting a bit tired from doing so much. My body is getting tired, my mind is getting more tired and along with that my emotional health can get off kilter if the first two are out of sync. My Virtual Assistant business ~ This breaks my heart as my VA business has been very successful and I love my clients. Computer time. Yep, I’ve taken a VERY small position with our local school district. 2.5 hours a day! Don’t laugh! That’s BIG news for me. So although it seems like this is adding to my plate, it actually gets me away from the computer screen and out into the real world…with kids! For me, I’ve become too sedentary, I’ve gained too much weight and I get headaches from too much screen time. I usually do the bulk of house work in my house…cutting back and delegating! Business wise ~ I’m getting into more of a schedule. Being out of the house daily will force me to be more productive with the time I DO spend on the computer. (I can WASTE a lot of time online) hanging head low. I’ve made more specific goals for my business and to reach these I need to be WAY more focused. Exercise! I’ve truly been getting out more and walking, plus I’m working on getting back into the routine of another exercise program that I LOVE! PLUS I’m the recess teacher so …lots of walking around. I’m adding a very precise blogging schedule, one that will be flexible but one that will help me to focus on my real goals. I’ve been using a helpful app that is helping me to stay on track by adding my food intake, exercise, caffeine and it even takes my blood pressure! Pretty cool! I’m diligently taking Centrum® VitaMints® daily! Good intentions of eating don’t happen every single day and I’ve got to get real with myself … I hope you will too. I love these new Centrum® VitaMints®. They have an amazing cool mint flavor and are packed with the vitamins that my body needs to stay healthy. Who would have ever thought that there is a vitamin you enjoy like a mint? Love ‘em! They truly have a refreshingly minty flavor so they are a great way to remember to take them on the way out the door to work, school or wherever! You don’t need to have water or food to take them either. They provide adults with essential nutrients you enjoy like a mint. Centrum® VitaMints® offers consumers a truly unique, and surprising pleasant-tasting, refreshingly minty multivitamin in Cool Mint flavor, which can be taken with or without food or water, from America’s most-preferred multivitamin brand, Centrum®. Centrum® VitaMints® is a complete chewable multivitamin that includes key nutrients—like B Vitamins, and Vitamins C & E— to help fill nutritional gaps and support your energy, immunity and metabolism*. Visit the Centrum® VitaMints® website for more information! I am also adding more focused family time. It’s easy to get super busy in your own life when your kids are in High School. I’m there for them daily…but I’m always working…like checking my phone…etc. Even though I’m removing some very good things, it is going to allow me to add even better value to you my readers and to my family…and of course to me! I love the reevaluating process. I love listening to what God is up too and what directions he wants me to go. I’m all for doing what is right and glorifying Him. 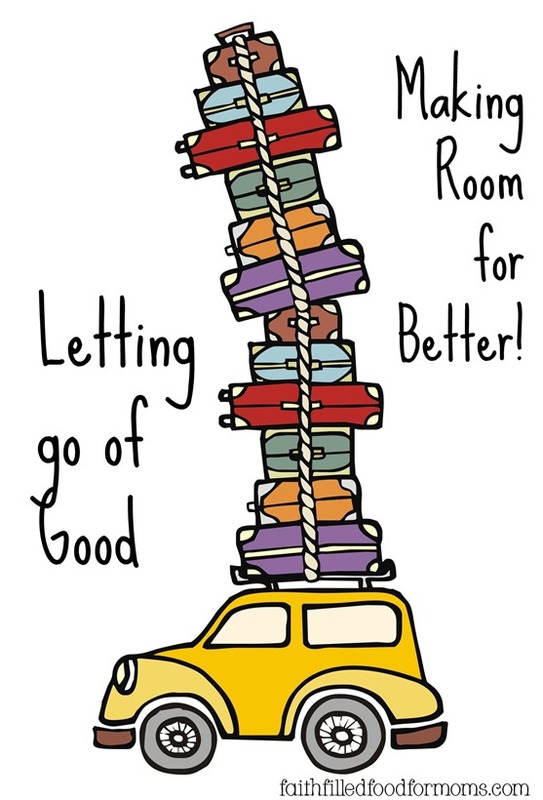 Which means letting go of good to make room for better. Fall does seem like a good time for reevaluating our schedules and our priorities! I’ve been having to do some of this as well. I just took a new part-time job out of the house – working about 15-20 hours a week. Makes you get really organized, doesn’t it! Congrats on your new job at the school and on starting to exercise again! I was “parked” near you on Modest Mom.